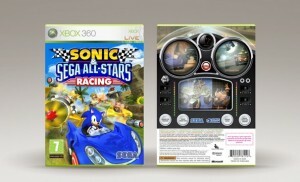 The box art for the Xbox 360 version of Sonic & SEGA All Stars Racing has been leaked and on it we can see the rumours regarding format exclusive characters were true. The back cover reveals Rare’s Banjo and Kazooie will be appearing in the Xbox 360 version of the game. Now we’re left to wonder who will be appearing in the PS3, Wii and DS versions. With Wii and DS both being Nintendo formats it’s likely the same character will appear on both of those formats. So perhaps Mario on Wii and DS? Ratchet and Clank on PS3? There’s no telling who will be in the PC version. We’ll just have to wait and see. Thanks to Spark from Spindash.de for bringing this news to our attention from Chris Lewis’ Website who is Sega Europes boxart designer. Chris say’s on the page that the box art is a work in progress but this still obviously confirms Banjo and Kazooie. Banjo and Kazooie! I loved their games. I think they would would fit well in this game. I bet it’ll be Sackboy or Kratos for the PS3 version. Ratchet and Clanck for PS3 i think. Forget Mario, bring us Capt. Falcon! I’m thinking (hoping) either Jak and Daxter OR Ratchet and Clank for PS3 (it’ll probably be someone like Drake, or the Sackboy), Captain Falcon for Wii, and Mario for DS. Personally, I’m hoping for Sackboy for the PS3 version, Mario for the DS version, and either Captain Falcon or Kirby for the Wii version. I say Captain Falcon should be in, but it’s guaranteed to be Mario. Lame. ^Crash Bandicoot (and I might as well add Spyro) were never Sony IPs. They have always been owned by Vivendi-Universal. Click the right arrow until you see their names. ^Wrong. I have Spyro and Crash merchandise from the mid-90s that says Copyright 19XX Universal Studios, which is a division of Vivendi-Universal. Odd. I thought Naughty Dog owned Crash and Insomniac owned Spyro. Oh well, I never really examined too far into those franchises. ^Yeah, almost everyone makes that mistake. It’s because (I think) Insomniac and Naughty Dog had studios on Universal property, and the agreement was that they would make the characters for Universal, but Sony needed mascots of their own for the new PlayStation and jumped in on the “mascot hunting”. Obviously, it was only a temporary contract; that’s why the characters have been multiplat since the PS2 era. Sackboy for PS3 would be awesome! I just know Mario has got to be in the nin consoles. Huh, wasn’t aware of all that.. but it would explain the cross over the 2 had several years ago. o_o Sony need a mascot. Maybe it’ll be Kaz Hirai? – RIDGE RACERRR! OMG WHAT IF CRASH BANDACOOT WAS ON THE PS3.*faints*Awesome. Wii/DS: Mario. Obviously. No matter how much we gripe and moan for Link, Kirby, Capt. Falcon or any other Nintendo character with a history of racing, it’s gonna be Mario. In one of his karts from Mario Kart Wii. PS3: Sackboy. Why? Think about it: the Sonic costume downloads in his own game LBP fans are gonna get next month! That could’ve been a clue to the sackperson’s appearance in ASR. His car could be one of those cardboard cars you could drive in the City level in LBP, but for ASR, the big switch could be mounted onto a 360 degree gearbox for easier compatability with the wheel peripheral. If anyone would be in the Wii version it would be Mario; so stop complaining!! Mario is not only the face of gaming but also Nintendo’s leading mascot and it would feel unjust for him not to be the one. Also, Banjoe and Kazooie on the 360? WTF that sounds weird but also pretty interesting. I’ll be keeping watch. Yes Banjo is way better than Master Chief. Stupid Master Chief. This makes me happy because I already have a Banjo action figure that I can now put with all my Sonic figures. I too don’t care who they choose for the PS3 and am rooting for Mario or even Mario and Luigi together on Wii. Nah. If they did decide to include a Pokemon character in the Wii/DS versions (Which I doubt) they’de prolly go for Pikachu. Banjo-Kazooie in the 360 version of the game actually makes sense since Banjo’s first appearance was in Diddy Kong Racing for the Nintendo 64. Oh yeah: I don’t think the PC version will have any exclusive characters, but we’ll have to wait and see.